Assam Chief Minister Sarbananda Sonowal said the incumbent governments in the state and the Centre would grant ST status to six communities sans disturbing rights and privileges of existing ST communities. He informed this while having a discussion with representatives of six communities – Moran, Motok, Tai-Ahom, Koch Rajbongshis, Chutias and Tea Tribes – here on Thursday. 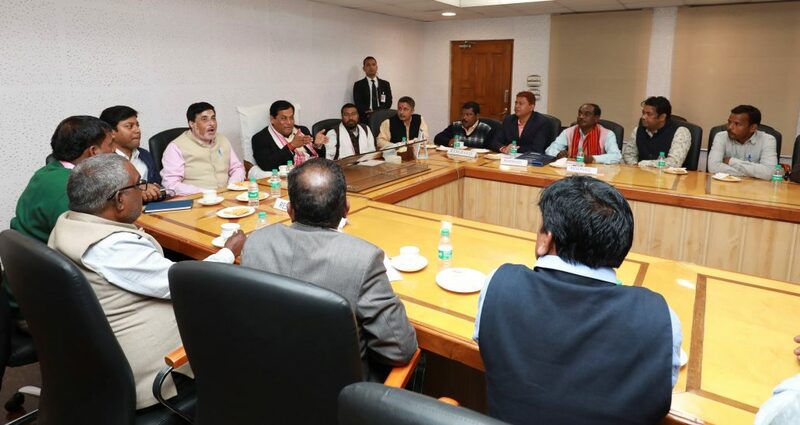 Sonowal said that the government would prepare its proposal and submit the same with the Centre after discussing with all the stake holders to facilitate granting of ST status to six communities without affecting the rights and privileges of the existing ST communities. He also said that the central government had introduced a bill for granting ST status to six communities after fulfilling entire requirement from RGI, National Commission for Scheduled Tribe and Central Cabinet. He said that a Group of Ministers (GoM) had been constituted with the state Finance Minister Dr. Himanta Biswa Sarma as its chairman to expedite the entire process. Sonowal said that to safeguard the language, culture and literature ST status to six communities were important. Convener of the GoM Chandan Brahma also informed that the GoM would meet and discuss the issue with all stake holders from 28 January to 3 February to take the issue to its logical conclusion. Chief Minister Sonowal also informed that the present Central and State governments have taken a special consideration of granting ST status to six communities without disturbing the rights and privileges of the existing ST communities. Sonowal also asked the six communities not to pay any heed to the propaganda and miss information being circulated in this regard.